"Uncle Scrooge takes Donald and the nephews on a perilous trek in search of the fabled seven cities of gold! This is the Scrooge story famous for providing Steven Spielberg and George Lucas with inspiration for parts of Raiders of the Lost Ark. Speaking of gold and movies, James Bond fans might recognize in “The Mysterious Stone Ray” a gimmick that was later used in Goldfinger — Uncle Scrooge’s pores fill with gold dust from his money bin. It makes him ill so he goes on vacation, which turns into a rescue mission for a sailor stranded on an island with some very mysterious baddies. Also, Scrooge decides to run for Treasurer of Duckburg, but it seems the only way to get votes is to spend a lot of money. (Sound familiar?) And you know what Uncle Scrooge thinks of that! 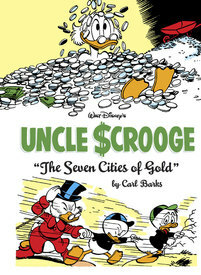 Carl Barks delivers another superb collection of clever plot twists, laugh-out-loud comedy, and all-around cartooning brilliance"
Dive right into Scrooge's money bin with this PDF Preview.